Graphic Novel Universe: Action! Mystery! Thrills! 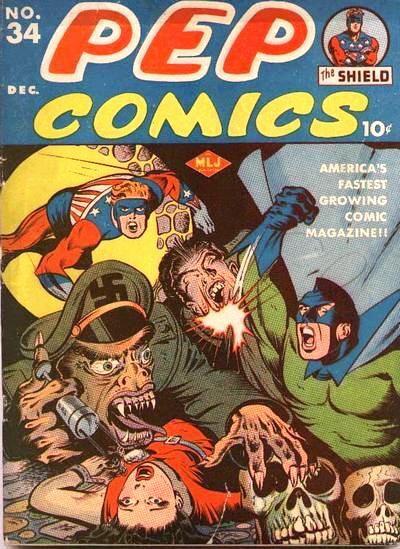 Comic Book Covers of the Golden Age 1933-1945 (2011) - Greg Sadowski, ed. Action! Mystery! Thrills! Comic Book Covers of the Golden Age 1933-1945 (2011) - Greg Sadowski, ed. One look at the cover of Action! Mystery! Thrills! might be enough to turn off many potential buyers. I mean, come on, you’ve got swastikas and hooded fiends surrounding a young woman about to be sacrificed. 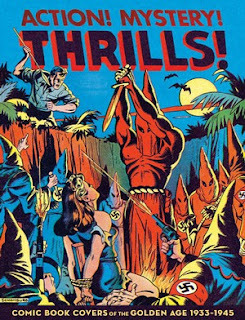 Not exactly PC.... We learn from the inside of the book that this is one of the rarest of comic book covers drawn by Alex Schomburg from Suspense Comics #3, April, 1944. Okay, I get that it’s rare, but editor Greg Sadowski still could’ve used a different cover. The front cover not withstanding, Action! Mystery! Thrills! 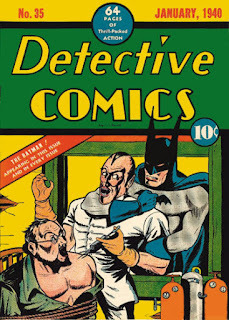 reproduces nearly 200 covers the Golden Age of comics, featuring many characters we’ve all seen (Superman, Batman, the Human Torch, Captain America, Goofy, Donald Duck) and many we probably haven’t. I’m no purist, so I don’t know whether these colors exactly match the originals, but who cares? 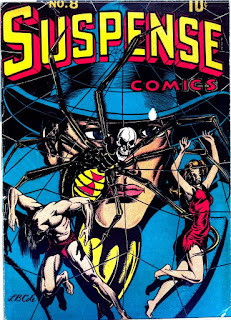 The covers are a combination of stunning, silly, laughable, horrifying, lurid and sometimes jaw-dropping art from a period when comic books were finding their audience largely through trial and error. 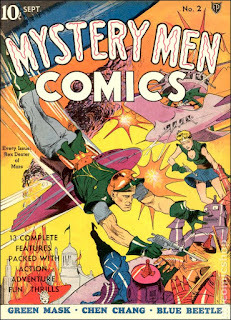 After a brief foreword by Ty Templeton, readers are treated to a parade of covers, followed by thumbnail images of each cover with a brief bit of text about them, the comics themselves, and their creators. Part of the fun of Action! Mystery! Thrills! 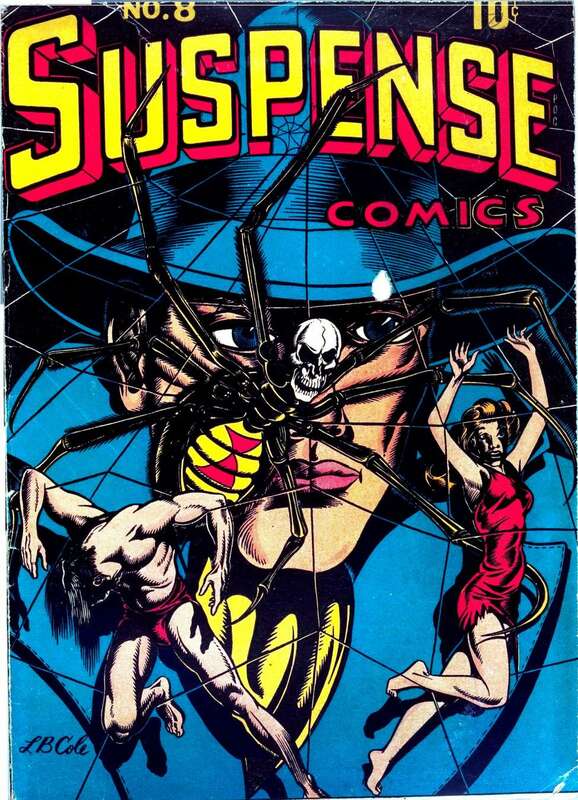 is in discovering some of the ploys publishers used on their covers to try to attract the buyer’s attention. Many included contest announcements like “Win a Double Barrel Daisy Air Rifle” or “Cash Prizes/Monthly Contest.” Others, to avoid confusion from comics that were serials or reprinted newspaper strips, would tout, “Complete Features” or “All New Comics.” Plus you can’t help but chuckle when you read some of the featured character names like Rang-a-Tang the Wonder Dog, Rex Dexter of Mars, Bob and Swab, and many others. As we get closer to WWII, the covers get very racist and sometimes misogynistic. You can also see the infancy of horror elements that would come to the fore in the years following the war. Action! Mystery! Thrills! is a fine representation of the comics covers from those years. Comprehensive? Probably not, but again, I have such a limited amount of experience with comics of the Golden Age, that’s for someone else to decide. If you’re remotely interested in comic book history, pick this one up. The $29.99 price is a little steep, but you can probably find a copy on-the-cheap online or at a remaindered bookstore. Don't You Wish All Classes Were This Cool?